Join the League’s VOTE411.org Registration Challenge! We need your help today in making sure that every eligible American is registered to vote. Send this e-card to your co-workers, friends, and loved ones, and encourage them to register to vote by visiting VOTE411.org – our “one-stop-shop” for election-related information. Are YOU registered to vote? 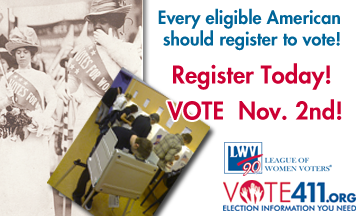 With less than two months left until the upcoming midterm elections the League is committed to making sure that every eligible American is registered to vote. If you are not yet registered, simply click on the postcard to find VOTE411.org's online registration tool and other voter registration resources. Make sure your co-workers, friends, and loved ones are registered too by sending this e-card and encouraging them to register to vote by visiting VOTE411.org – our “one-stop-shop” for election-related information. And don’t stop there, post this information on your Facebook profile and Tweet it to all your friends to make sure they get the word out too! The outcome for our elections and our country is in your hands. Register to vote today and remember to head to the polls on November 2nd.